The Annual Beginners Course is now only 2 weeks away! 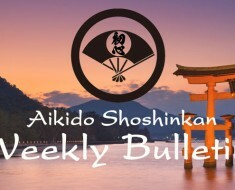 It is really important to us that we continue to expand our Aikido family, however this is impossible without your help! It is in all of our best interested that we have an ever-growing group and the best way for newbies to join is via the Beginners Course – this was how I started myself! We urge you all to share the news using social media and word of mouth to raise awareness for the start of the course and encouraging people to get involved and join the family. We also have posters made by our own very talented Lucy Kong that you can put up in your work place! Any help in this regard will be greatly appreciated! Lets get recruiting for our family!!! This is a course perfectly designed for a beginner to transit in to a fully paced regular class. With the focus being on the absolute fundamentals, anyone can benefit from these classes, even a seasoned black belt! This year will include an element of self-defence too! All courses will cost a fee of £60 for the 5 weeks. 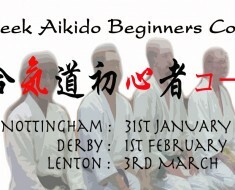 Please spread the word and help our Aikido Family grow! This will cover you for the full years training at our Dojo for any injuries or problems that may arise. We also ask for these fees to be paid in full before the 31st of January 2019 please. If you have not renewed your insurance then unfortunately we cannot allow you to train. An insurance form will also need to be completed with the payment. You can find these attached or get them from Sensei Tad or Sensei Rowan. Note that there is a different form for adults and juniors. The date for the first Junior Grading of the year has been set for Saturday 2nd February 2019. This is only for students who attend the advanced junior classes and have a green belt or above. Please speak to Sensei Tad about grading if you are unsure as to whether you are eligible or not. For syllabuses please approach Sensei Tad or Sensei Rowan. For information will be made available closer to the date. See the attached document for the long awaited brand new cadet’s syllabus’s! Note that the cadets will grade at the same time as adults; helping them transition from junior classes in to adults. Beginners Course 2018 Coming Soon!